The Southern Martlett was a single engined, single seat biplane sports aircraft. Six were built, including the rather different and unsuccessful Metal Martlet. The Southern Martlet was the first aircraft designed by teams led F.G. Miles, whose first company was Southern Aircraft of Shoreham. It was a modified Avro Baby, differing in the tail unit, undercarriage and engine, the 85 h.p. A.B.C. Hornet air-cooled flat four. Like the Baby, it was a single bay staggered tractor biplane, with fixed two wheel main and tail-skid undercarriage. 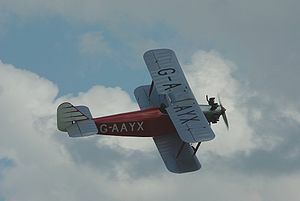 The prototype G-AAII made its first public appearance on 30 August 1929 at London Air Park, Hanworth, and proved to be a very manoeuvrable sports machine. Five production aircraft were built at Shoreham, differing chiefly in the choice of engine. Three of them had 80 h.p. Armstrong Siddeley Genet II and one a 100 h.p. Armstrong Siddeley Genet Major. These were five cylinder uncowled radials. One aircraft had, at different times, a de Havilland Gipsy I or II (100 h.p. and 120 h.p. respectively), upright in-line air-cooled engines. The Martlets were not very successful as racers but served a succession of private owners as aerobatic mounts. Prototype first flew with an ABC Hornet later fitted with a 85hp Armstrong-Siddeley Genet II engine. First production aircraft with a Genet II engine. Second production aircraft with an Armstrong-Siddeley Genet Major engine and untapered ailerons. Later operated by Butlins and now still airworthy with the Shuttleworth Trust. Third Production aircraft with a de Havilland Gipsy II engine built for F.E. Guest. Fourth production aircraft with a Genet II engine built for the Marquess of Douglas and Clydesdale. Fifth production aircraft with a Genet II engine for Miss Maxine Freeman-Thomas (who later became Mrs F.G. Miles). The Metal Martlet, despite its name had little in common with the Martlet. One completed, not a success and a second aircraft was not completed. Southern Martlet Pictures and Southern Martlet for Sale.